Our company is the leading provider of man with van Prescot services. If you need to hire a van in Prescot, we’re there to provide. We have been offering removal services in Liverpool and the greater Liverpool area for a couple of years now. We offer only the best in terms of speed, quality and professionalism and are among the leaders in moving services in Prescot and the region. Located at about 8 miles off the city center of Liverpool, it is both a town and a civil parish part of the Knowsley Metropolitan Borough. The town is among the oldest in England, dating back at least a thousand years. The name of Prescot is of anglo-saxon origin and means a cot owned by priest. Although traditionally it has been part of the county of Lancashire, its district is today a part of Metropolitan Borough of Knowsley, after counties as administrative units seized to exist in 1974. Call us at 0151 554 9058 for additional info. Our customers can expect complete dedication and only the highest level of quality from each of our man and van in Prescot. We can boast a large team of experienced movers with years of practice in home and business removals in Prescot and the Greater Liveprool area. Each mover working for us has undergone several training courses throughout the years to attain the required level of skills to practice the trade in accordance with our high standards. We follow both UK and EU legal regulations as well as various industry organizations recommendations and membership requirements. Our man with van Prescot services are the fastest and most reliable in the entire area. We can move any item or items of any size as we have vans in various sizes, always ready to transport a load. You are the one who specifies the date, time and items to be moved from any location in Prescot to anywhere in the greater Liverpool area. Our friendly drivers will pick up and deliver anything from huge couches to kitchen furniture and ovens fast and secure. You don’t have to worry about the condition of your belongings – we guarantee that they will be delivered. You can trust us to take care of the entire process from collection, packaging, storage and delivery (please note packaging and storage are additional paid-for services). The prices we offer are extremely competitive. Hiring a removal van doesn’t have to be expensive. We do our best to personalize the offer and apply flexible pricing if possible. 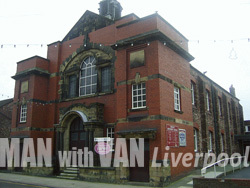 We complement our superb offers for man and van in Prescot with one of the bets support teams in the business. No matter what your question or issue concerning our activities is you can reach us via email or phone every day of the week and we’ll do our best to provide you the needed information or service support you might require from us.